At the age of 10 my parents and I left the U K over land to Africa, a trek of four and a half months. We arrived in Livingstone on the 30th of March 1947 and visited the Falls for the first time the next day. At that time the infrastructure at the Falls consisted of a few railway houses opposite the station, Clark's store, Sopers Curious, and the Pink Elephant ice cream parlor and of course The Victoria Falls Hotel. About 500 yds up river from the falls on the south side embedded in the bank is a steel stanchion to which a steel cable was attached to another stanchion on a small island about 100-150 yds off shore. This was to stop the flying boat if it ever broke free of it's moorings. Tourists from the Vic' falls hotel used to frequent the tearoom for afternoon tea, as there was no transport at that time they arrived by TROLLEY. The line used to run from the hotel to Livingstone Statue and then onto the tearoom. 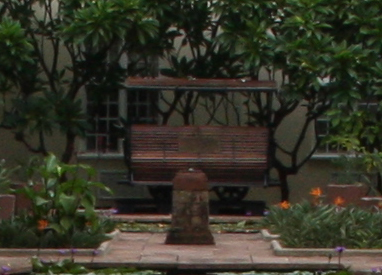 These are the trollies which you can now see in the garden of the Victoria Falls hotel. These were pushed by two Africans dressed in white. Up from the Livingstone Statue to where a car park is today. There were four Africans with two dug out canoes and for two shillings and sixpence they would take you over to the north bank to another tearoom. At that time there was nothing along the south bank except the game rangers house.